At Mam'selle LTD, we have everything a bride needs for her special day. Whether that's THE dress, an elegant veil, fabulous shoes or glamorous jewelry, you can find it here! Not only do we have dazzling wedding gowns, but we also have a large selection of dresses and accessories for the bridal party, too. 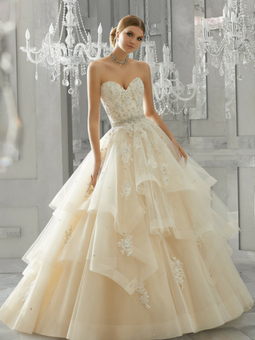 We have dresses from designers such as Mori Lee, Jasmine, Christina Wu, Rosebud, and more! If we don't have the exact gown you are looking for, we can get it! From bridesmaids and flower girls to the bride, we have the experience and resources to dress your entire wedding party.